The BDX45, BDX46 and BDX47 are silicon PNP planar Darlington transistors and are mounted in Jedec TO-126 plastic package. They are intented for use in industrial switching applications. The complementary NPN types are the BDX42, BDX43 and BDX44 respectively. SLA6050 SILICON NPN TRIPLE DIFFUSED PLANAR DARLINGTON / SILICON PNP EPITAXIAL PLANAR DARLINGTON View Sanken Electric co.,ltd. 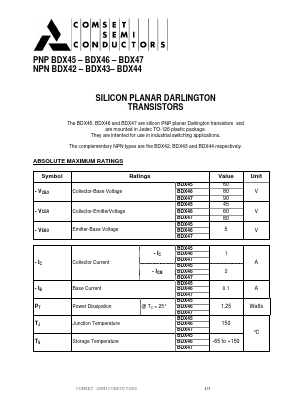 ZTX604 NPN SILICON PLANAR MEDIUM POWER DARLINGTON TRANSISTORS View Diodes Incorporated.